There's nothing more obnoxious than looking at the clock, realizing your favorite show is about to start and knowing it will take a miracle to get your friend off the phone. You know the one. She chat incessantly about tofu and taking her cat to the vet. You love her, but you've had enough of her. Now you won't have to pretend you're getting another call to hang up. 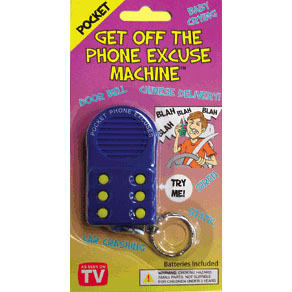 The Get Off the Phone Excuse Machine delivers sweet relief from a never-ending barrage of boredom with the press of a button. Choose your excuse and this clever gadget will mimic the sound of a car crash, baby crying, Chinese delivery driver, doorbell, siren or phone static. Free at last!